Mothman is a legendary winged creature alleged to have been encountered in western West Virginia, notably near Point Pleasant, West Virginia, and along the Ohio River in Mason County, in 1966 and 1967. Some proponents of the legend claim the creature was encountered in the ’70s and even more recently. Mothman is also believed to play a role as a character in the Fallout 76 video-game, to be released in October 2018. 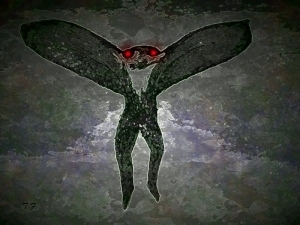 Mothman was introduced to a wider audience by Gray Barker in 1970, and its story was further popularized by John Keel in his 1975 book “The Mothman Prophecies,” which claimed that there were supernatural events related to the sightings and a connection to the collapse of the Silver Bridge. The 2002 film “The Mothman Prophecies,” starring Richard Gere and Laura Linney, was based on Keel’s book. 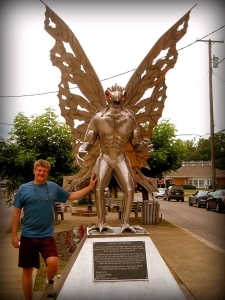 The annual Mothman Festival in Point Pleasant is devoted to the Mothman legend. 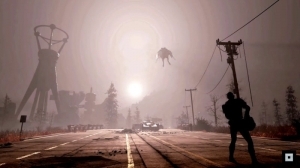 Mothman may appear in this screencap from the new Fallout 76 game. On November 12, 1966, five men digging a grave at a cemetery on a hill above the Elk River near Clendenin claimed to see a humanoid figure flying low through the trees overhead — an encounter now often cited as a first sighting of what became known as the Mothman. On November 15 two young couples from Point Pleasant — Roger and Linda Scarberry and Steve and Mary Mallette — told police they encountered a “large, flying man with ten-foot wings” that followed their car through “the TNT area,” the site of a former munitions plant that operated during World War II. Its eyes “glowed red” in their car’s headlights. The first newspaper report published in The Point Pleasant Register on November 16, was titled “Couples See Man-Sized Bird… Creature… Something.” National news outlets picked up the reports and helped spread the story across the U.S.
Other people reported similar sightings over the next few days. Two volunteer firefighters who saw it described a “large bird with red eyes.” Mason County Sheriff George Johnson commented that he believed the sightings were due to an unusually large heron. A local contractor, Newell Partridge, told the sheriff that when he aimed a flashlight at a creature in a nearby field its eyes glowed “like bicycle reflectors.” Sheriff Johnson also blamed buzzing noises from his television set on the creature, as well as the disappearance of his German Shepherd. West Virginia University wildlife biologist Robert L. Smith reported in a December news article that descriptions fit that of the sandhill crane, a large bird nearly as high as a man with a seven-foot wingspan and which features reddish feathering on the top of its head. The bird might have wandered out of its breeding ground in the Mississippi Valley, Smith speculated, and went unrecognized because it was not native to the region. After the collapse of the Silver Bridge and the deaths of 46 people on December 15, 1967, speculation arose that the Mothman sightings were related to the tragedy. Writer Grey Barker in 1970 popularized the legend through a series of books and further tied reports of the creature to the collapse of the bridge. Keel’s book became the seed of the 2002 film “The Mothman Prophesies,” which popularized the tale on a global scale among younger audiences. However, reports of encounters with the Mothman didn’t end with the collapse of the bridge, says Jeff Wamsley, co-founder of the Mothman Festival and Mothman Museum at Point Pleasant. Man aspects of the tale are still left to be told, and chroniclers have confused the tales, he says. “Most journalists don’t understand that there were multiple witnesses — more than 100 in the first few years, and things went on for months after [the bridge collapse]. The movie pushed that aspect, and we [also] have newspaper clippings from ’68 and ’69, even into the ’70s. Point Pleasant held its first annual Mothman Festival in 2002, now held on the third weekend in September, featuring a variety of events, including guest speakers, vendor exhibits, a Mothman pancake-eating contest, and hayrided that focus on the notable areas of Point Pleasant, including the Point Pleasant battlefield and the grave of Cornstalk. A 12-foot-tall metallic statue of the creature, created by artist and sculptor Bob Roach, was unveiled in 2003 and installed on Fourth Street in Point Pleasant.